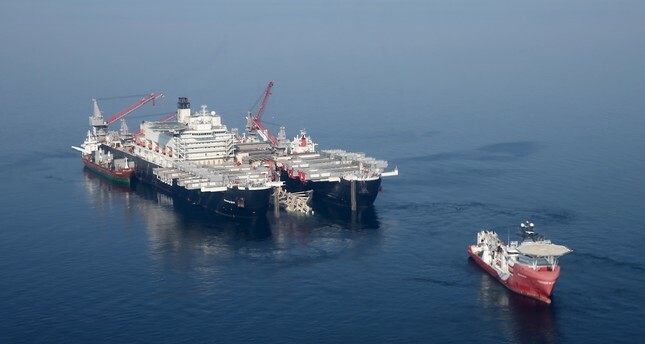 The world's largest construction vessel, Pioneering Spirit, is now cruising to the Black Sea in order to finish the deep-water construction of the second offshore line of TurkStream. The world's largest offshore construction vessel, Pioneering Spirit, owned by Swiss company Allseas, has sailed to the Black Sea from the port of Rotterdam on Friday in order to start pipe-laying operations for the second line of the TurkStream natural gas pipeline. TurkStream, a Turkish-Russian joint energy project will deliver Russian gas to Turkey via one line and to Europe by a second line. Pioneering Spirit was expected to come to the Black Sea in the third quarter of this year. Therefore the earlier than expected arrival of the vessel will accelerate the process. Pioneering Spirit completed the pipe laying of the first line in late April. The average rate of the deepwater pipe-laying process was 4.3 km/day. TurkStream project spokesperson Aslı Esen told Turkish reporters in Moscow that Pioneering Spirit went to the North Sea for another project after completing the first line in Kıyıköy in northwestern Turkey, located approximately 100 kilometers west of Istanbul. She announced that the vessel has returned to the Black Sea to continue working on the second line of TurkStream. Pioneering Sprit also completed the construction of 224 kilometers of the second line of the project and has reached the border of Turkish-Russian exclusive economic zone. The first line that will deliver gas to Turkey via offshore pipelines. The first line sits a couple of kilometers off Kıyıköy. Another vessel named Lorelay owned by Allseas will bring the line to the shore. The spokesperson also said the environmental impact assessment process for the line that will connect the TurkStream to Turkey's natural gas network in Lüleburgaz was completed. Esen said that protocols on the establishment of TürkAkım Gaz Taşıma A.Ş. in Gazprom and Turkey's Petroleum Pipeline Corporation (BORTAŞ) partnership for the second line were signed last week. She said they expect the second land line to progress rapidly in this frame. She added that Greece and Bulgaria are still on the table as possible routes from which to take natural gas to Europe. "The construction of Russia's landing facility on the Anapa coast is now almost complete. We are putting the finishing touches," Esen said. "It will be ready for operation by the end of the year. The Russkaya Compressor Station is also ready for operation in cold standby and can be operated within 24 hours." In Kıyıköy, preparations at the reception terminal construction site were completed, Esen said. Pointing out that pipes to be laid on land have started to be transferred to Kıyıköy, Esen said Boskalis, the company which will make the coastal transmission, had completed preconstruction surveys and was almost ready to start construction. She added that the Lorelay ship belonging to Allseas, just like Pioneering Spirit, will come to the coast of Kıyıköy in the fourth quarter of this year and will complete the pipe laying and tube drawing processes in shallow water. Russian National Energy Security Fund Vice President Alexey Grivach said that Turkey is the biggest buyer of Russian gas after Germany. "TurkStream pipeline will cure Ukrainian and other transit risks. While the first line ensures Turkey's energy security, the second line will serve the same function for South and Southeast Europe," Grivach said. "If Turkey's gas needs increase in the future, in addition to creating the capacity to meet it, there will be economic returns for Turkey." Grivach said last year Russia met 55 percent of Turkey's needs alone with 29 billion cubic meters of natural gas exports. "As you know, the Russian natural gas comes to Turkey in two lines, the West Line and Blue Stream. Last year more than 90 percent of the capacity of these two lines was used. Almost half of Russian gas comes via West Line reaching Turkey through Ukraine, Moldova, Romania and Bulgaria," Grivach said. Grivach stressed that they have been experiencing problems with Ukraine regarding transit for many years. "In 1998, 90 percent of Russian natural gas transited through Ukraine. Today this rate is down to 40 percent, but it is still very high," he added. Minister of Energy and Natural Resources Berat Albayrak had previously said that they would complete the second line of the TurkStream project with Russia by the end of 2019. Alexander Medvedev, Vice Chairman of the Russian energy company Gazprom, said Friday that the European companies have begun preparations for possible natural gas from TurkStream. The first line of the gas pipeline is intended for Turkish consumers, while the second line is designated for the South and Southeastern Europe. Each line will have the throughput capacity of 15.75 billion cubic meters of gas per year. South Stream Transport B.V., a wholly-owned subsidiary of Gazprom PJSC, is responsible for the construction of the gas pipeline's offshore section.